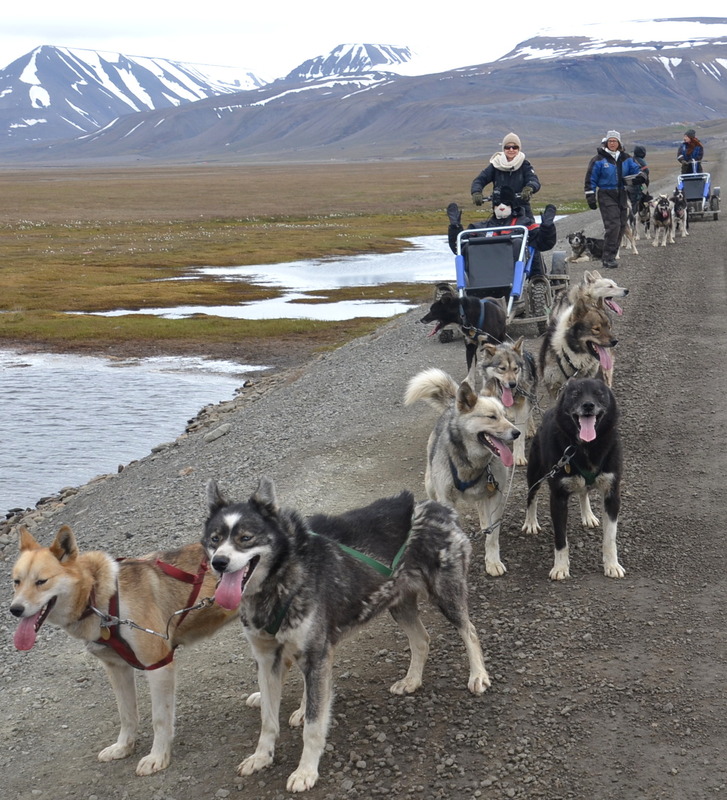 It started out like a normal dog sled/cart ride in the summer in Spitsbergen. But in an instant, it changed into an all out war. Two dogs just glanced at each other as they were put side by side in the third position for pulling the ride and a vicious fight broke out instantaneously. June was given the assignment of holding the dog team and I had to hold down the brake on the cart so the dogs wouldn’t take off until the team was ready. And the last 2 dogs immediately didn’t like each other. We didn’t know what the dogs were fighting about but the thought hit my mind that all the dogs on the team would get into the fight. Maybe the dogs don’t get to interact with each other much at the Green Dog Sled Park except when they were pulling the dog cart. Or maybe it was the off-white color hair on one dog or off-white with a black back on the other that they didn’t like. We didn’t know but a vicious fight ensued. First one went for the throat, then the face, then the leg, ear and on and on. Then blood was dripping. 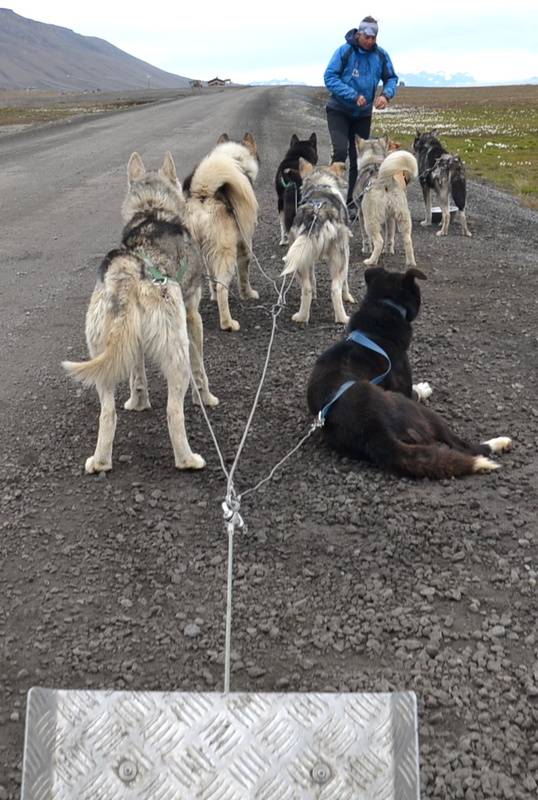 Peter, the dog sled attendant, ran to break them up but to no avail. The dogs were stronger causing him to fall several times. 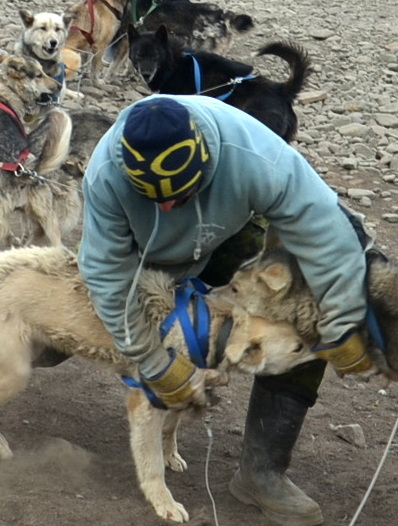 After watching the fight for several minutes, a female sled attendant helped and the dogs were stronger than both of them. And she was bitten and bleeding. It seemed like the fight would never end and that the attendants would never get control. Over and over they tried to break up the 2 mad dogs but they couldn’t. And the interesting thing about this fight is that the other dogs all stood and watched together. And they were behaving like perfect dogs. Finally, after 5 minutes (it seemed an hour) of desperately trying to separate the dogs, the attendants succeeded and were able to gain control. 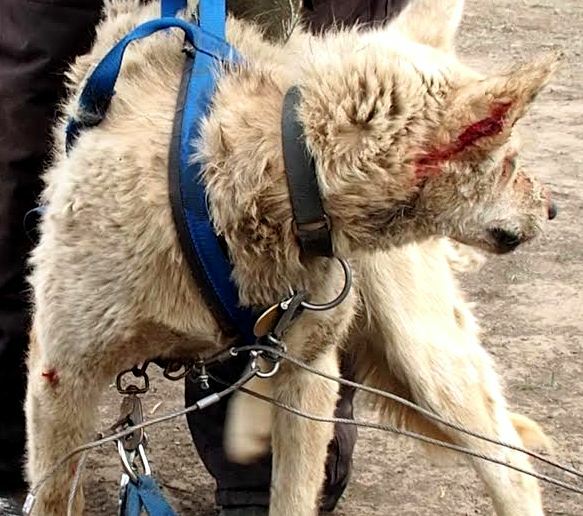 The dogs were rushed to a veterinarian for treatment. And putting together the team continued with 2 new dogs chosen to work side by side and they got along beautifully and worked perfectly together. No fight occurred this time. 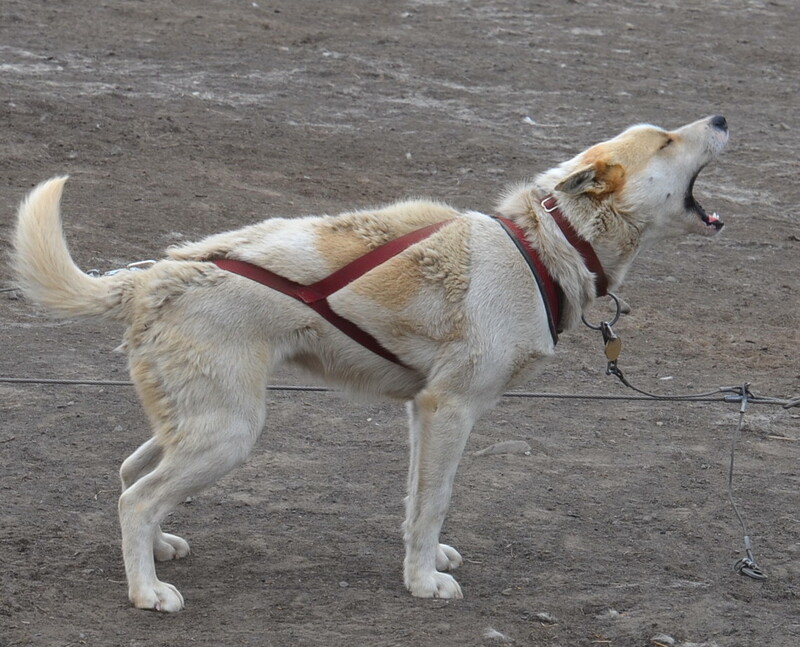 PICK ME FOR THE TEAM this barking dog might be saying because all of them are raring to go on every dog sled. After all 8 dogs were hitched: the team was raring to go. But first June had to get in the cart from her position of holding the dog team so they would not run. 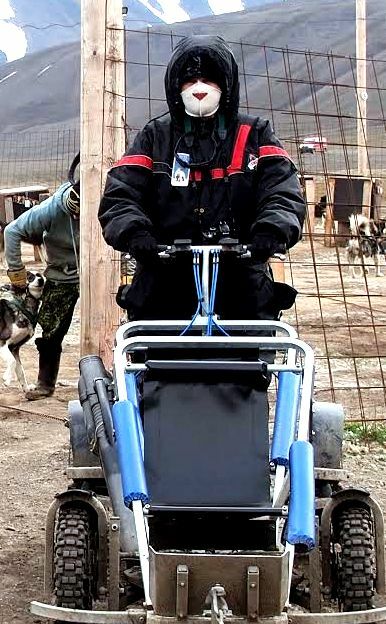 June took this photo of me holding the cart brake down so it wouldn’t move while the dogs were hitched to the team. It was freezing cold in Longyearben, Spitsbergen, Svalbard. And I had to turn over holding the brake down to Theresa so I could get in the cart. We never knew we would be put to work building the dog sled/cart team. When we signed the form where we agreed to proceed at our own risk, we never knew what would happen and that we would be put to work to ride. Now all was ready to go down the gravel road in our cart. 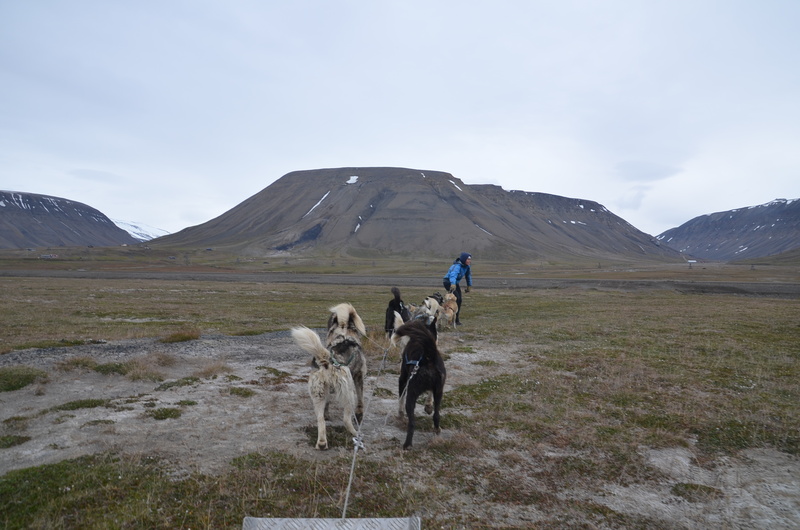 With 8 dogs pulling us, we proceeded at a good pace in the open territory toward the old airport in Longyearbyen. But nature called shortly after rounding the first corner, and a time-out was called to allow all dogs a potty break. It was around 6-7 degree centigrade (about 45 degrees Fahrenheit) and just on the edge of being too hot for the dogs. 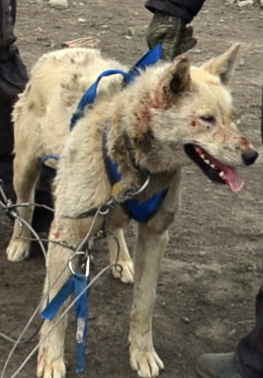 Still shedding their thick winter fur, they easily became hot as they pulled us in the cart. Several dogs even lay down and rested for a brief moment. Several days before, it was warmer and 2 dogs collapsed from the heat. So caution was taken on this day. Theresa said in the winter, the dogs work every day and do not get hot. But in the summer, all the 170 dogs are rotated for the heat and the exercise. Every 3-4 km (quarter to half a mile) Theresa had to stop the ride and water the dogs and let them rest. Their tongues were hanging out about 6 inches and they were panting heavily. The best water in the world was right by the road. Getting 2 pans out, she walked to the flowing stream of newly melted mountain and glacier snow. It was cold, just perfect for those hot dogs. The lead dogs were first to drink and they lapped it down fast. 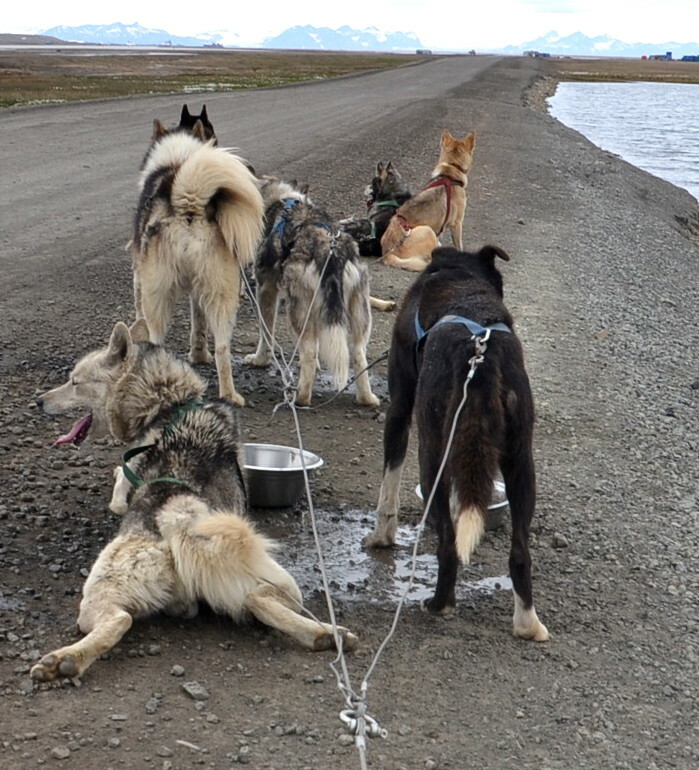 Then on through the team she proceeded, allowing each dog time to have lots of ice cold water. And then she offered all of them a second chance at the cold water. Before the break was over, Theresa poured the ice cold water on the back of each dog as she parted the thick fur to reach the hot skin. All the dogs seemed happy now; so on we went toward the old airport. They sometimes pulled to the left or right but mostly they pulled the cart in a straight line. They knew the route well and had performed many rides for the tourists. 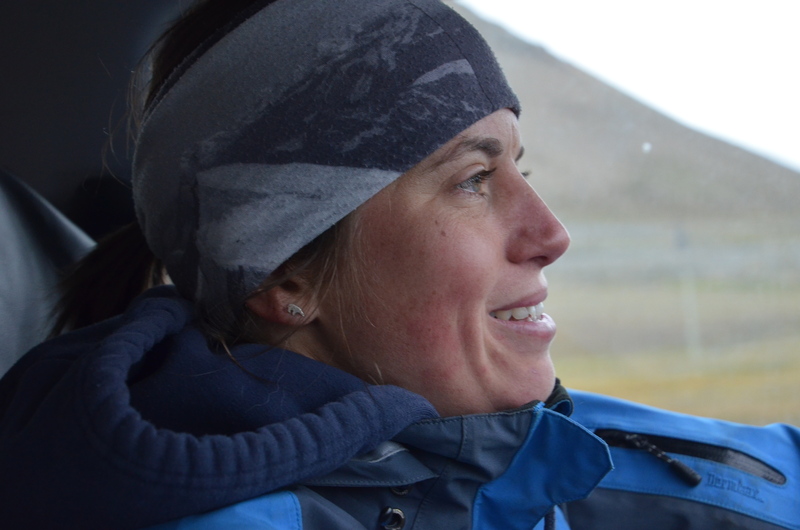 Theresa gave an audible command to the team which meant leave the road and go on the grass. After repeating the command several times, the dog team complied and turned onto the grass and stopped. This was the turning around point to return to the dog park. And they were happy to comply because they were going home. Theresa, the lady who drove our dog cart/sled. After several stops for more cold water, the ride ended at the dog park where the waiting dogs barked at the team and the team barked back. All were happy. 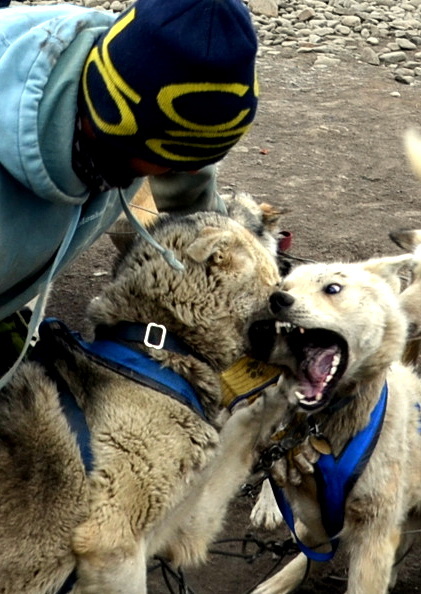 It is normal for sled dogs to have fights. Males fight for dominance with another male or female and vice versa. And fights can occur concerning breeding. 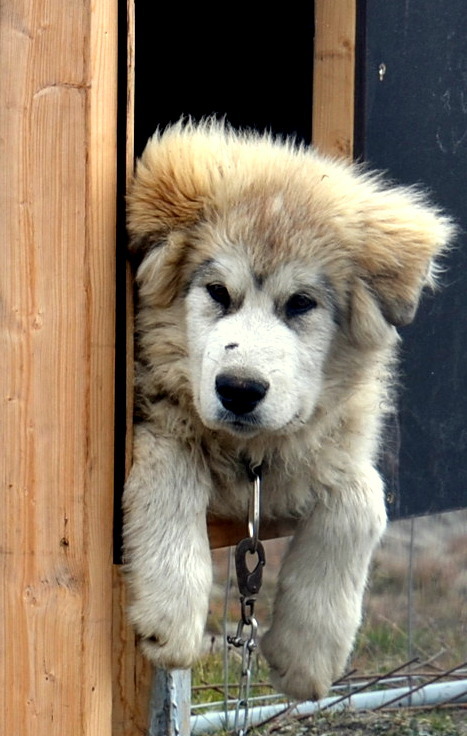 A cute one in training to be a Sled Dog when he grows up. 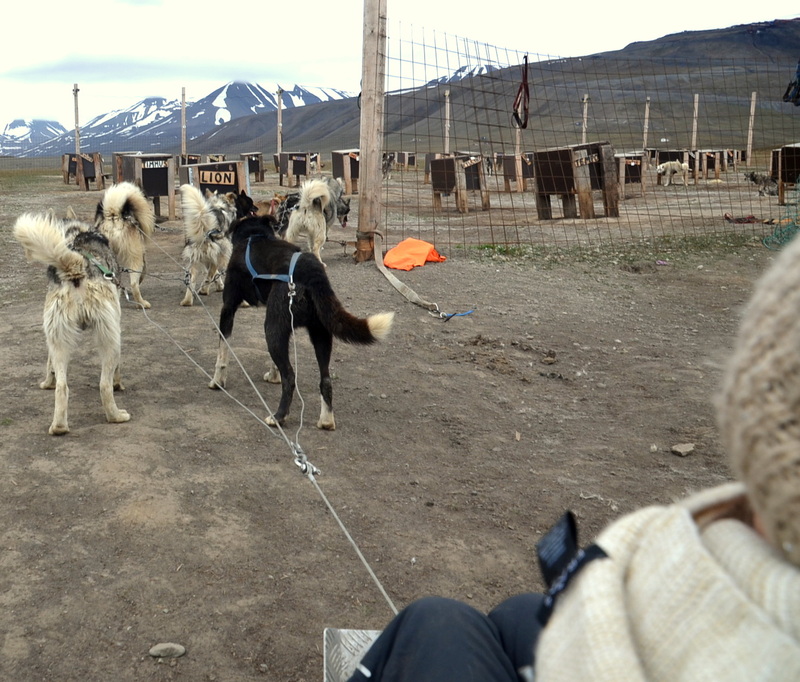 The sled dogs start to be trained for rides around 10 months old and are given easy rides at first. 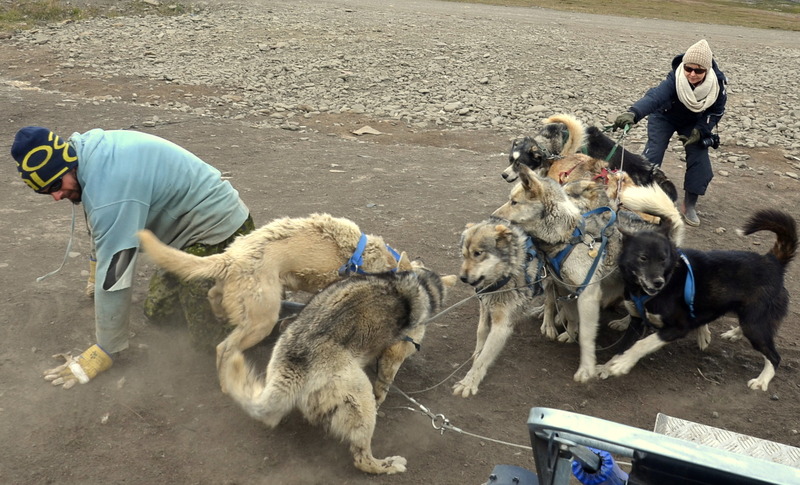 Then as they progress, they become full time sled team members at 1 ½ to 2 years old and they generally pull sleds until 8 years. But we were not happy until we saw the puppies. And waiting for us was Misa and her 6 three-week old pups. They were so fat and cute and stinky. 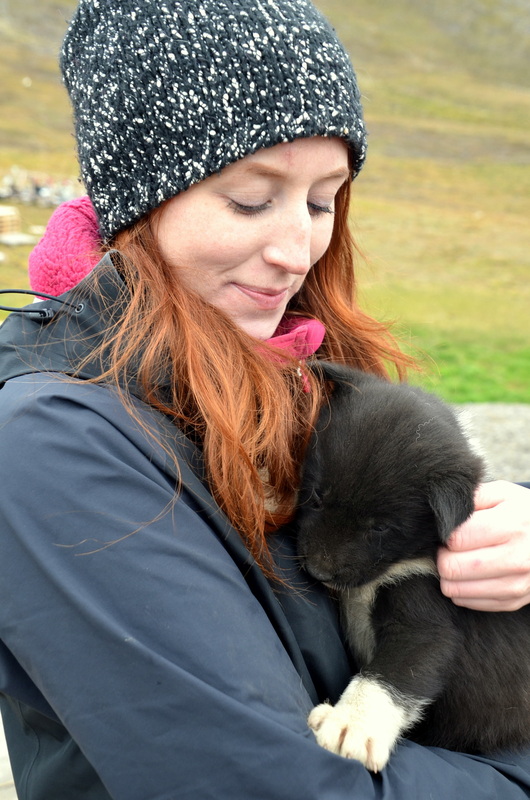 But we just had to hold them and cuddle them. And then we were happy too.